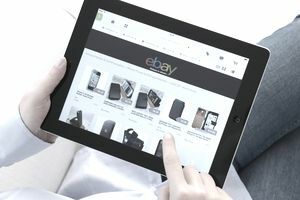 Although many eBay users would like to link their business websites to their auctioning accounts, it's almost impossible to do so if you sell goods or services on your business website because eBay's links policy forbids links to external sellers. However, there are a few ways you could list your official website on the "About Me" section of your eBay page. Although eBay may seem like the perfect place to generate business leads, it's nearly impossible to drive sales to your business website in item descriptions, your About Me page, your eBay ID, on your eBay Stores pages, or within graphics and images; you'll even encounter the same difficulty if you try to link your business in an email address, QR code, or some other form of contact. There are exceptions to eBay's links policy, though, notably for larger sellers who obtain special permission to place the links, so it is worth it if you're a big enough business interested in using eBay as a driving tool for further on-site sales. So how, then, can you use eBay to drive off-eBay sales? You'll find the answer to that question within the eBay links policy, a guide you should read thoroughly. If you want to add information to any eBay page you control—your item listings, your eBay store, or your About Me page—you should consider whether a buyer can use the information to purchase an item directly from you without going through eBay and Paypal. If the answer is yes, eBay probably forbids the addition, or the company will adjust their rules to ban it once enough sellers emulate the practice. There's a simple business logic behind the policy: eBay understandably doesn't want shoppers to bypass their service when they make purchases from sellers on its site. Just because eBay isn't a great tool to drive off-eBay sales doesn't mean that it's not a great tool for promoting your business, though, and several ways remain in which you can use your eBay activity as an effective promotional tool. Namely, you can use it to drive repeat eBay sales by consistently providing a great product coupled with great customer service and—provided you regularly list on eBay—which ultimately could yield repeat buyers. eBay also can help you to build name recognition. If you have a memorable company name, and you brand your listings, item descriptions, and images carefully (just not with contact information or links), customers may find you simply by Googling the name of your business the next time around. The key: your product, customer service, and listing effort must be good enough to make a lasting impression. While eBay can keep you from promoting your business on their website, they can't control what you include in the box that arrives on your customers' doorsteps. Along with the product, you can pack promotional material, contact information (including your website URL), catalogs, order forms, and anything else that advances your business. To take full advantage of the opportunity, pack your merchandise in branded boxes, make sure the logo appears on your shipping label, always include your business card, and you can even throw in a bag of jelly beans tied with a ribbon that has the address of your web store printed on it. With the right delivery, customers will remember that they bought the product from you rather than that they bought it from eBay. In this way, you'll be using the eBay brand as an introduction to your own.